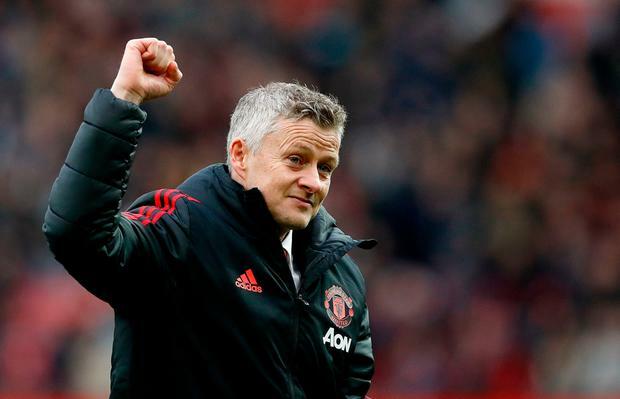 Manchester United's manager Ole Gunnar Solskjaer acknowledges the crowd after the final whistle during the Premier League match at Old Trafford, Manchester. Martin Rickett/PA Wire. Manchester United manager Ole Gunnar Solskajer and match-winner Paul Pogba admitted their side were lucky to secure a 2-1 win against West Ham at Old Trafford, as they kept alive their hopes of a top four finish in the Premier League. Two Pogba penalties ensured United avoided a third straight defeat, but the French World Cup winner admitted his team were well below par as they secured a fortunate victory against plucky West Ham. The win moved United ahead of Arsenal, who don't play until their trip to Watford on Monday night, but this was not the display of a team bursting with confidence. "I think we had the luck, you always have to take it, sometimes it is for the other team but we took it today," Pogba told BT Sport. "I can’t explain if we are tired from the Champions League game but we have to rest now for Tuesday, but this was not a good performance. "It was a really open game, but we didn’t play well. With the chances and space we had, maybe we played too slow. We will have to fix that, learn from that and focus on next one." United manager Solskjaer was equally honest in his assessment of the game, as he suggested his team failed to find their spark for a third game in succession. "We got away with it," he conceded. "I know it is not easy because we played on Wednesday and we made a few changes, but the performance was not good. West Ham deserved to get their goals but we are allowed to have a good goalkeeper. "There have been two games away recently where we have played well and not got what we deserved but the last two games at home against Watford and West Ham we probably got what we didn't deserve, so it evens itself out over the season. "They played better than us, it is fair to say, I don’t think anyone will disagree, but in a few years no-one will remember how we played if we finish in the top four. With a performance like this, we all know we will struggle in Barcelona, and we will have to improve." Meanwhile, frustrated West Ham manager Manuel Pellegrini suggested mistakes from the match officials were crucial in deciding the outcome of the game, after his side saw a goal incorrectly ruled out for offside as they also argued United's first penalty should not have been awarded after Juan Mata's clash with Robert Snodgrass. "I think we should have won three points," declared Pellegrini. "We played against Manchester United at Old Trafford and it was a good performance but unfortunately we couldn't win. "I don't want to complain about the referee because I think all of them were difficult decisions, but it was not a penalty on Juan Mata and our disallowed goal was onside by just one foot. "The second goal they scored was a mistake and also offside although we made a mistake in the build-up. With VAR I think we would have won this game. "We had the possession and the chances of the game but you need a bit of luck to win the games. It is more difficult to finish in the European places but my target is to finish as high as we can and we will fight to the last day to achieve that. Playing like we did today will make it easier."